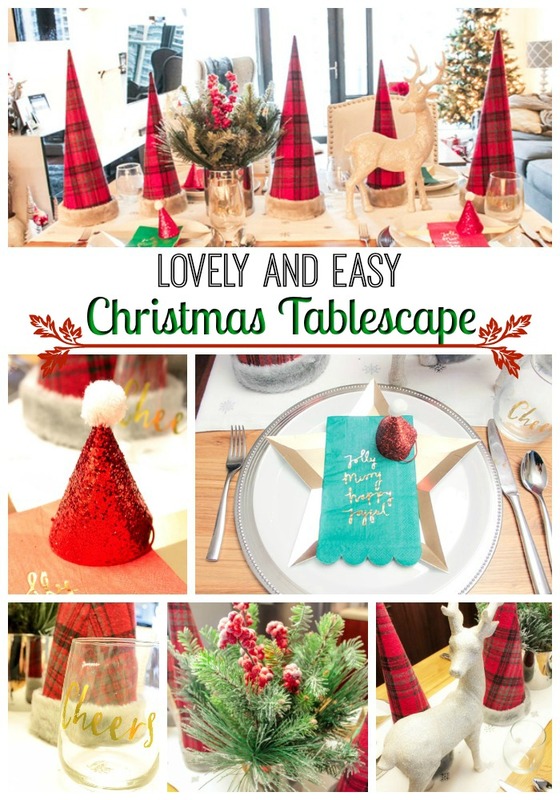 Holiday Tablescape Blog Hop: Lovely & Easy Christmas Tablescape! We think everyone is channeling their inner plaid this Holiday season and so are we! We are so excited to bring you this lovely and easy Christmas Tablescape that is full of super cute details. Plus it is easy on the wallet! 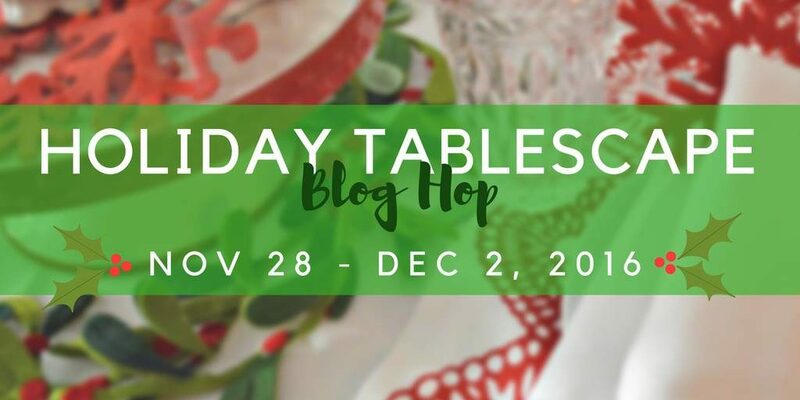 Emily here from B. Lovely Events and I am thrilled to join this talented group of bloggers for the Holiday Tablescape Blog Hop this week! Today I am giving you a real behind the scenes look of the Miller Household. This is the first “not on location” shoot that I have done but wanted to show you that you can do a lovely Christmas tablescape anywhere with any number of people. Me and my husband live in an apartment and this little lovely island table is our dining room table. We love it because it is super duel purpose, one side holding our pots, and the other housing our chairs and a space for us to dine at. It also fits perfectly right in our kitchen! Just because it is small, doesn’t mean you can lovely it up for Christmas or any other occasion for that matter! Christmas for us can be just the two of us a lot of times or we spend it back in Colorado with a big family. My Christmas tablescape shows you the more intimate 2-4 person setting that you can put together. Just because it is small, doesn’t mean it can’t make a big impact. There are so many thing I LOVE about this Christmas tablescape. 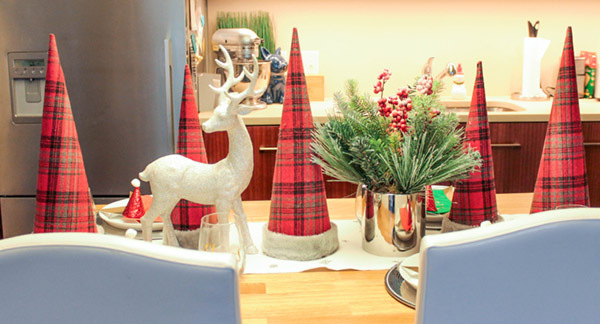 The plaid cone Christmas trees are so lovely and create a beautiful dynamic eyeline to the table. Plus it has great tuxture with the cozy fur wrapped at the bottom of each one. 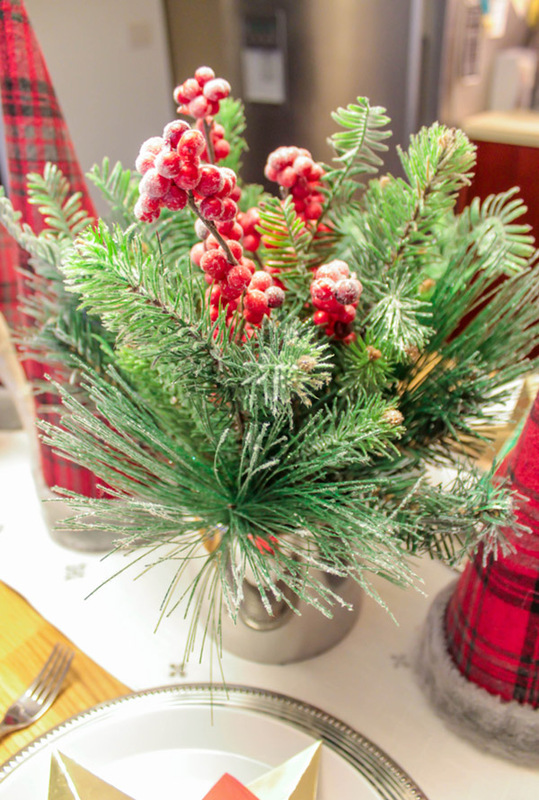 I love seriously love the winter berry evergreen centerpiece in a bright silver vase too though. It brings just the right about and winter and shine to the table, all in 1 piece. I also really adore these Christmas place settings! I always say a great place setting starts with a great charger and this silver one is so gorgeous. I love the rimmed border around it. 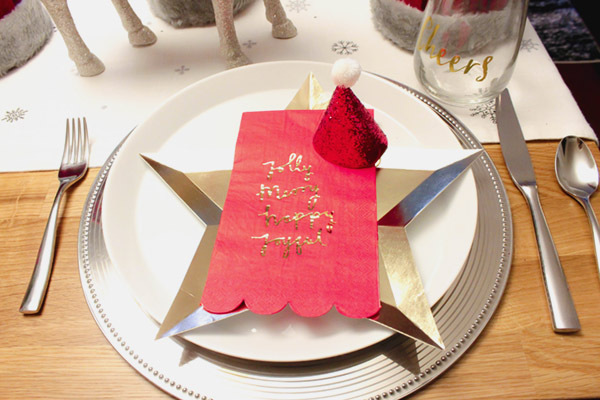 The mini Santa hats though at each place setting are super adorable. Probably my favorite detail of the whole table setting! 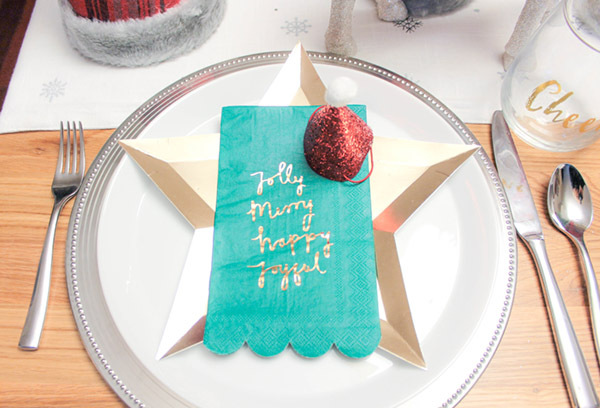 This gold foiled napkins are so merry and bright. They just bring this jolly, cheer to this table that I love. Especially with all of the gold saying on them. They go so well on the silver star plates. 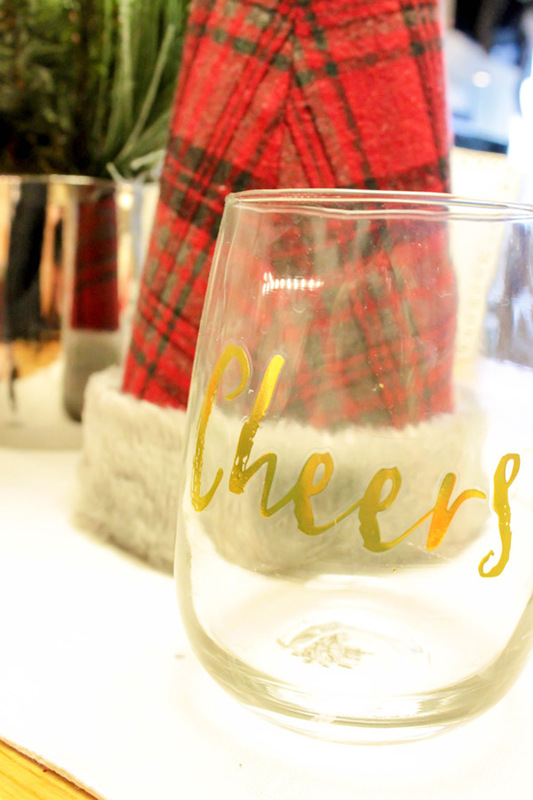 Speaking of cheers, once I spotted these cheers wine glasses, I knew they were perfect for this Christmas tablescape. Definitely gets you in the festive mood when you see them. The runner on the table perfectly matches the plaid Christmas tree cones and the snow brings a wintery vibe that I love too. Plus who doesn’t love a deer wearing a scarf?! Put those all together and you get this cozy, wintery Christmas tablescape full of some really cute details! This whole table comes out to under $50 too! If you are on a budget (or want something just simple and easy), then a tablescape like this for Christmas is perfect for you! Sometimes no fuss can be the best! Leaves more time for visiting with family and enjoying everything the season has to offer. Those fur trimmed plaid trees are so cute! Emily, I am so glad that you don’t look at your small dining space as a limit for how you can add style and holiday flair to your dining! 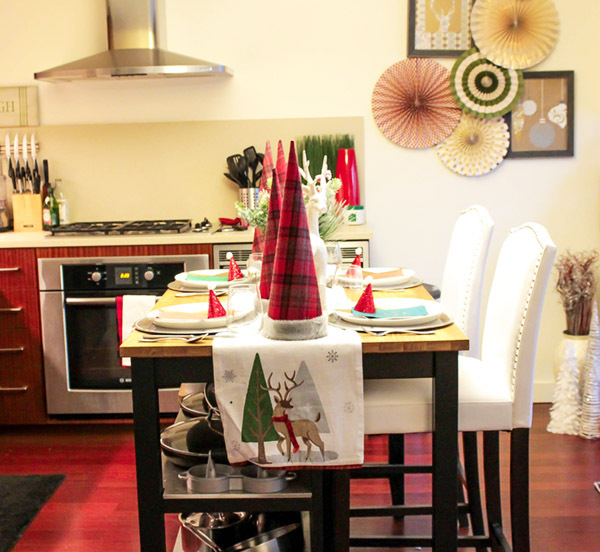 I am sure it is fun to tuck into your island to enjoy a meal with a little Christmas decor. Thank you so much for being a part of the Holiday Tablescape Blog Hop! Thanks so much Chloe! I felt really brave revealing my living situation but I feel so good about it now! So happy to be part of the blog hop. Can’t wait for next week too! 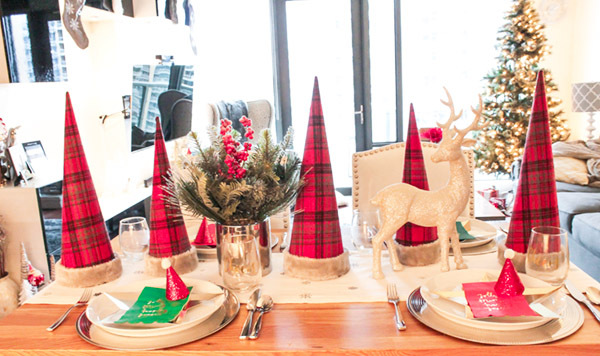 Emily, your Christmas Tablescape is so pretty and festive! 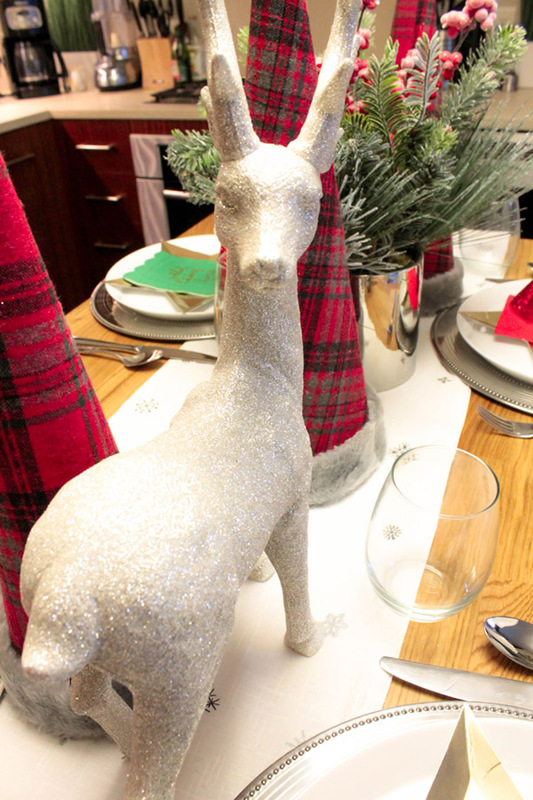 I love the centerpiece with the sweet plaid trees and beautiful frosted deer. I love how you illustrated how to make the most of your space. Your island made a gorgeous holiday table. It looks polished and inviting! Thanks so much Shannon! Such kind words! Emily, What a happy and stunning tablescape! Love , love your plaid trees. They are a showstopper and with the deer and all your other details like the cute “cheers” glasses, napkins with message, darling table runner makes a huge statement. Love your kitchen and especially the”Laugh” sign. Beautiful table Emily, I am loving your deer and that adorable table runner! 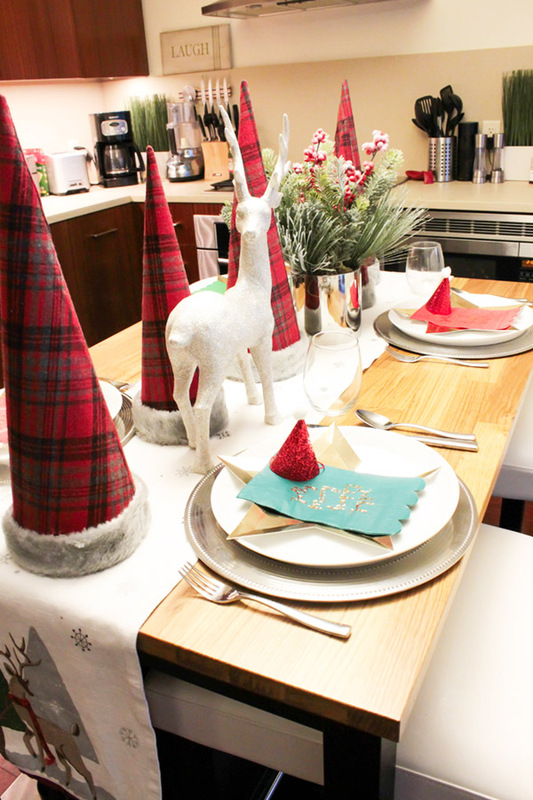 Emily, I’m so impressed with your tablescape ~ the santa hats from big to small are precious. I’m really impressed that your kitchen is so neat for the photo shoot! The plaid with the fur on the bottom of the big hats is awesome and the little glitter hats are just so cute. happy to be sharing the Tablescape blog hop with you. Aww Carol, what a touching note. SO glad you enjoyed the table. The mini hats are so cute aren’t they! Happy to be sharing the blog hop with you too! This table makes me so happy! Love the mini Santa hats and the happy gold messages! 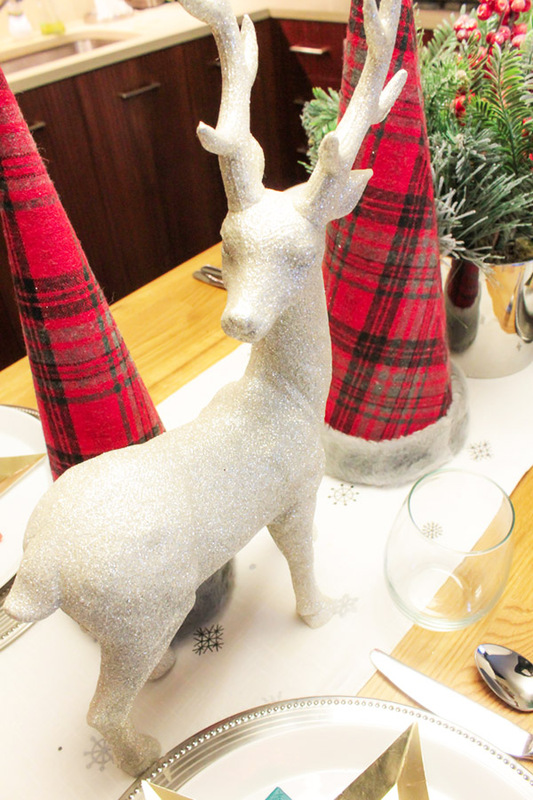 The deer looks so cute wandering through the Christmas tree forest down your festive table! And cute cute runner, Happy holidays! Thanks so much Jenna! So glad the table makes you so happy. It makes me happy too! Beautiful table emily with your plaid trees and Santa hats. Truly a very merry table to enjoy. I adore the deer and the christmas tree centerpiece. The runner darling with the deer. Beautifully done. Merry Christmas. Thanks so much Linda. I am so glad it makes you feel Merry! Merry Christmas! Emily, this is a perfect example of being lovely, no matter what the space or budget.I have plenty of nieces (and 1 of 2 daughters) who live in small spaces that serve dual purposes, and this shows how classy it can be. Or, alternatively, living alone or downsizing – it’s a perfect setting for up to 4. Love the cone trees down the table, and the centerpiece. Great job! Thanks So much Rita! The cone trees are my favorite as well! Emily, your Christmas table and decor is wonderfully festive and so beautiful. I adore the plaid, your “cheers” glasses, the greenery, and the runner. The Santa hats are genius and so much fun! Everything is beautiful!!! Those plaid trees are so cute! I love the reindeer too! I especially love that you set this up on your island! Thanks Rhonda! The Cheers glasses are one of my favorite details! Emily, your table for two is festive and fun! 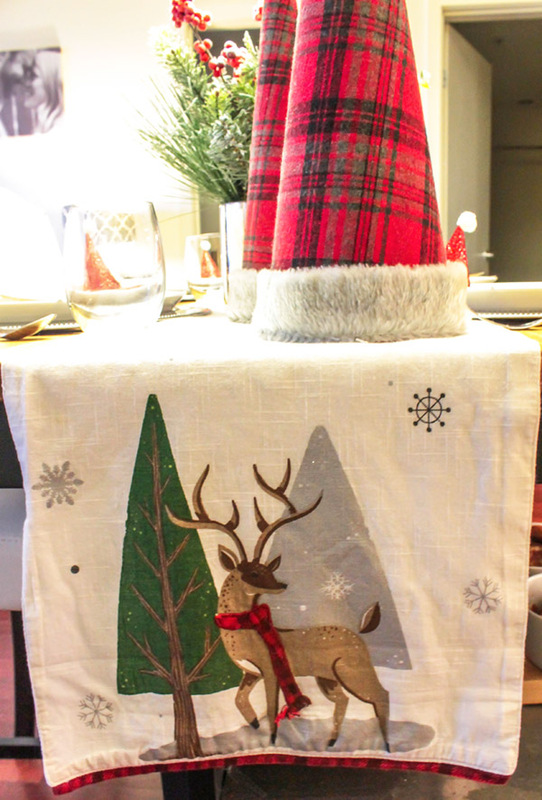 The table runner is so pretty and the plaid come trees are the showstopper! Who wouldn’t be thrilled to sit at your table? You are right, a lot of us have “our plaid on” these days but you’ve done a terrific job displaying yours! Very unique cone shaped trees which make a big impact on your table. 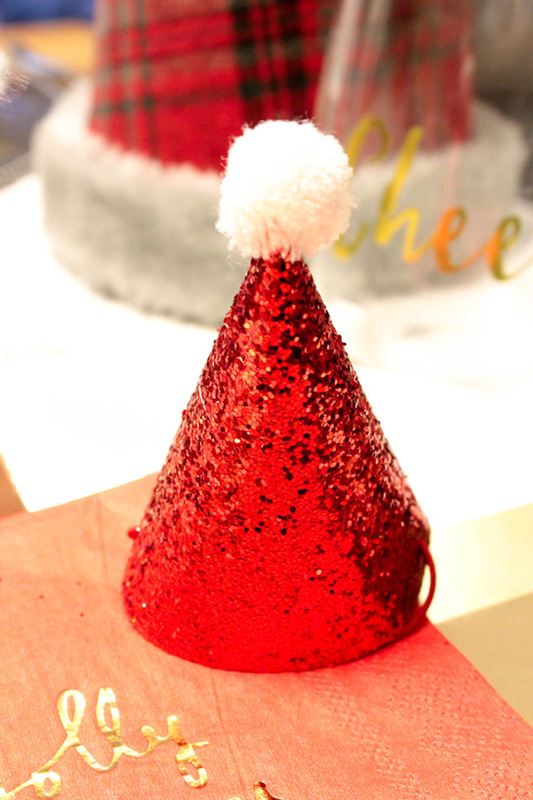 The cute Santa hats at the pretty place settings add such a welcoming vibe. I’m a firm believer in dressing your table for the occasion whether it is for a few or many and you’ve certainly demonstrated that it is the thing to do as well! Your table is so lovely. I am loving all the plaid accents you used. I am sure your guest are going to love dining at this table. Thanks BonBon! Plaid is so great this year! A deer with a scarf gets me every time! The ideas shown here have given hope and inspiration to those with small spaces not just for Christmas but year round. I love the Santa hats with the fur trim and I think my granddaughter would get a kick out of them as well. What a fun and festive table! Thanks Sandra! The deer with a scarf is really the cutest! I absolutely love the fun and festive feel of this table! It is so inviting! Beautiful table, Emily. I am gazing so fondly at your glassware. I saw this pattern at my mother’s holiday tables all my life. This last year, she had to go to an assisted living situation, so her precious things had to be parceled out. My sister-in-law asked for these glasses. There were so many sizes and many serving pieces. I just love how they compliment your polka dot plates. You did a lovely job.